And yet. I don’t know what I want to say. Do I want to write about but there for the grace of God go I? Do I want to write about how my understanding of climate change and fossil fuel dependency shifted from a knowing of the head to the knowing of the heart? Do I want to write about community and love and civility in the midst of crisis? I want to write about all the things but right now can’t seem to articulate any of them. The words will come. 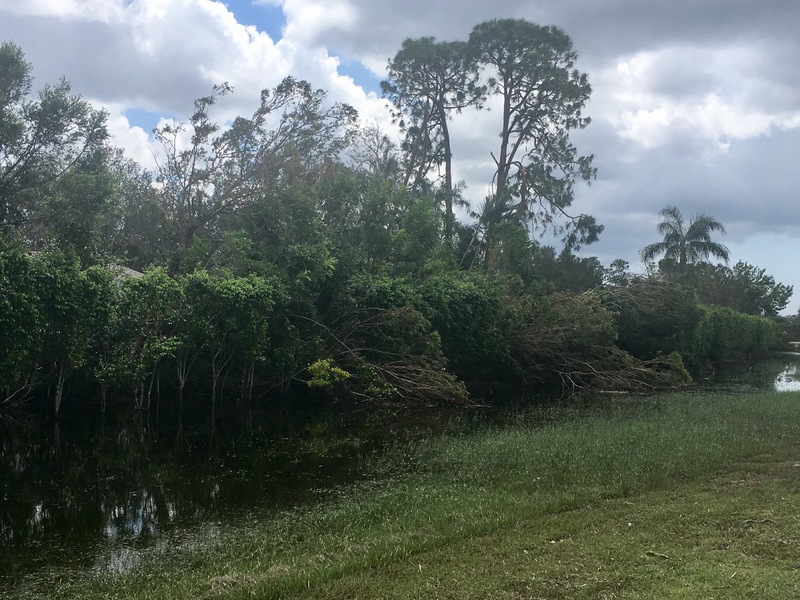 For now, I leave you with pictures from my walk yesterday with the dogs–the first “normal” walk since Irma came a knockin’, but as you can see from the pictures, things are still anything but normal. A lot of devastation at the lake near our home. The lake is still flooded (the water in front should not be there). We have seen record-breaking rainfall this year. There is a little blue heron in there. Can you find it? Curbs lined with debris for pickup.